I want to use all the right words to do this book justice, but I’ll fail. And that makes me angry. At myself. And at this book for being so great that I can’t describe it properly. And at the author for giving me this book and jumbling up all my emotions. And for making me love it so. ^^^ and that is how this book goes. Because this is how Ari goes. He’s an angry young teenager who doesn’t know why. Who’s so deeply honest with himself inside but so shut down to the world around him. Who gets angry at people for loving him and for making him happy. Who doesn’t know the hows or the whys of his emotions, yet feels them so deeply. This is Ari…confused and lonely and self-loathing…and the sweetest, most beautful, loyal, huge-hearted boy. 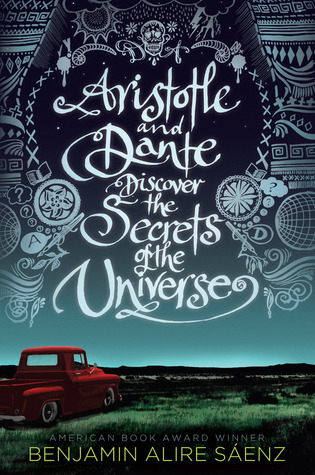 Ari, Aristotle in full…meet Dante. Dante, the free spirit. Dante, the boy who speaks whatever is on his heart. Dante, the boy who makes Ari laugh. Dante, the boy who pisses Ari off, but is unfazed. Dante, who is also lonely but wants to love so completely. Dante, who adores his parents. Dante, the sweetest, most beautiful, loyal, huge-hearted boy. This book is written in a style that seems so simple. Yet the emotions so complex and challenging to the reader. The cadence of the story telling is…quirky…syncopated…but RICH and FULL of meaning. The author’s way of depicting hard truths about life in such simplistic, in-your-face ways was addictive. Every single one of the characters is broken. Every single one of the characters is complete. Every single one of the characters is special. Every single one of the characters is made stronger by those they love. It’s a story about understanding yourself and acceptance. It’s a story about friendship and family. It’s a story about love and loyalty. It’s a story that will cut you open deep and expose everything inside of you and will then bring you back together and heal you. I laughed and cried at interchangably at every page. It was lovely and I’ll cherish having read it. It’s all the things I truly love about YA coming-of-age books…ones told with such honesty and trust. For those that read and enjoyed “Gives Light” by Rose Christo, I think you’ll really love this book. There’s a similarity there. An innocence that I believe can and still does exist in some teenaged boys these days. STILL…I LOVED this book! And would not hesitate to jump up and down and encourage you to read it! This entry was posted on November 12, 2014 by BioB in Reviewer: Susan, YA / NA and tagged 4.5 Stars, award winning, Benjamin Alire Sáenz, simon and schuster.